help autoimmune: Do infections increase the risk of developing Sjögren's syndrome? 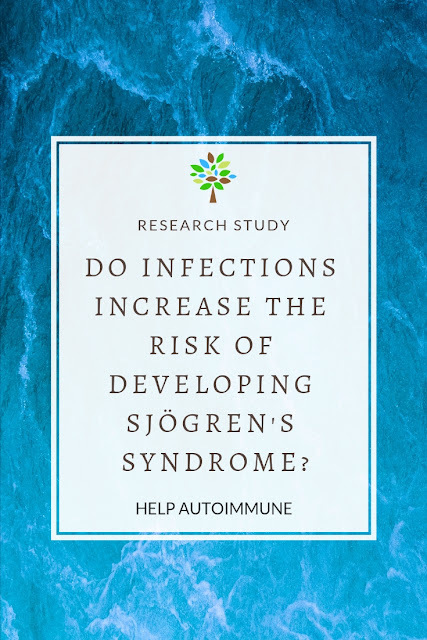 Do infections increase the risk of developing Sjögren's syndrome? Environmental factors have been suggested in the pathogenesis of rheumatic diseases. We here investigated whether infections increase the risk of developing primary Sjögren's syndrome (pSS). Patients with pSS in Sweden (n=945) and matched controls from the general population (n=9,048) were included, and data extracted from the National Patient Register to identify infections occurring before pSS diagnosis during a mean observational time of 16.0 years. Data were analyzed using conditional logistic regression models. Sensitivity analyses were performed by varying exposure definition and adjusting for previous health care consumption. A history of infection associated with an increased risk of pSS (OR 1.9, 95% CI 1.6‐2.3). Infections were more prominently associated with development of SSA/SSB autoantibody positive pSS (OR 2.7, 95% CI 2.0‐3.5). When stratifying the analysis by organ system infected, respiratory infections increased the risk of developing pSS, both in patients with (OR 2.9, 95% CI 1.8‐4.7) and without autoantibodies (OR 2.1, 95% CI 1.1‐3.8), while skin and urogenital infections only significantly associated with development of autoantibody‐positive pSS (OR 3.2, 95% CI 1.8‐5.5 and OR 2.7, 95% CI 1.7‐4.2). Furthermore, a dose‐response relationship was observed for infections and a risk to develop pSS with Ro/SSA and La/SSB antibodies. Gastrointestinal infections were not significantly associated with a risk of pSS. Infections increase the risk of developing pSS, most prominently SSA/SSB autoantibody positive disease, suggesting that microbial triggers of immunity may partake in the pathogenetic process of pSS.